We love our four legged friends immensely but, unfortunately, some of our beloved breeds are prone to developing health issues. Some health issues tend to be more serious and life threatening than others. Below we are going to discuss Syringomyelia in dogs. A very serious and terminal issue that affects dogs. Specifically Cavalier King Charles Spaniels and Brussels Griffon. For some reason, some dog breeds are more susceptible to certain issues than other dog breeds. 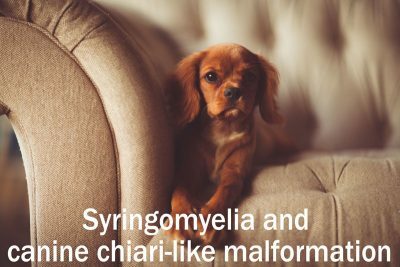 Syringomyelia and canine chiari-like malformation is more common in Cavalier Kings and Brussels Griffons. It is rare in other breeds. These two diseases go hand in hand. Syringomyelia is defined as: “a chronic progressive disease in which longitudinal cavities form in the cervical region of the spinal cord. This characteristically results in wasting of the muscles in the hands and a loss of sensation.” The cavities that form with syringomyelia are located near the brain. Cavities form because there is pressure coming from the brain. This pushes cerebrospinal fluid into the spinal cord region. The pressure coming from the brain is caused by chiari-like malformation. Chiari-like malformation is when the brain is too large for the skull. Unfortunately, this is not uncommon with the Cavalier King Charles Spaniel dog breed. The brain may be a standard size but the back of the skull is smaller and malformed. This leads to limited space for the cerebellum. In some situations, the brain/cerebellum may be too large, which puts pressure on the standard size skull. Whether the brain is too big or the skull is too small, there is a size differential present with chiari-like malformation which becomes debilitating and life threatening to the dog. When the cerebellum is pressurized it ends up getting push out of the small hole that is present in the back of the skull. It then creates a blockage in the spinal cord and interrupts the flow of cerebrospinal fluid. The interruption then causes pockets and cavities filled with spinal fluid. This, as we previously mentioned, is called syringomyelia. Again, syringomyelia and chiari-like malformation go hand in hand. Some symptoms of syringomyelia and chiari-like malformation are severe pain and hypersensitivity in the neck region. This disease is also referred to as the “neck scratcher’s disease” because dogs with this disease tend to constantly want to scratch or “get at” the back of their neck because of discomfort. Since pressure is on the dog’s brain and spinal cord, eventually paralysis will occur. It will be difficult for the dog to hold it’s head up, they will contort their neck and won’t be able to walk or use their legs. Syringomyelia in dogs is truly a devastating disease. Unfortunately chiari-like malformation is a disease and not much can be done without expensive and invasive surgery. But, the issues that it causes, including syringomyelia, can be treated and managed with several different techniques. Surgery is possible to remove spinal fluid and remove pressure but it is very dangerous and expensive. Surgery to treat Syringomyelia in dogs is often successful but it may have to be done several times over the course of a dog’s life. Drugs can be given to the dog to help ease pain and inflammation but they should be carefully used for long term care. Drugs, including diuretics, can also be given to the dog to reduce the amount of spinal fluid the body produces, but these can become expensive and they can have long term side effects on the dog. A stint may be inserted in the dog’s spinal cord to increase the flow of spinal fluid. Natural and homeopathic practices, like acupuncture, may give the dog some temporary relief. Lastly, the dog may have to have serious and invasive surgery on the skull to remove a piece of the skull and release pressure. In order to have this surgery, the dog must be experiencing several debilitating and deteriorating symptoms.If your dog is dealing with these two diseases you will have to analyze your dog’s future, your expenses, and your emotional state. It can be so sad to watch a dog in pain every day and it can be equally as difficult to weigh out medical expenses. Meeting with your veterinarian will be the first step in deciding long term plans for you and your dog.